The surface of a metallic object can be easily reacted in normal atmospheres making it behave quite differently from a piece of unreacted metal, a situation closely related to dissimilar metal corrosion. A film may be formed which is invisible, actually only a few molecules in thickness, but which may have a potential as much as 0.3 V different from the unfilmed metal. Naturally, such a potential difference is enough to create an active corrosion cell. Steels in soil have a tendency to film with time. ‘Old’ steel, i.e. steel which has been in the ground for several years may then become cathodic with respect to ‘new’ steel, even when the two are identical in composition pipe as shown in the following Figure. It is thus strictly a surface phenomenon. 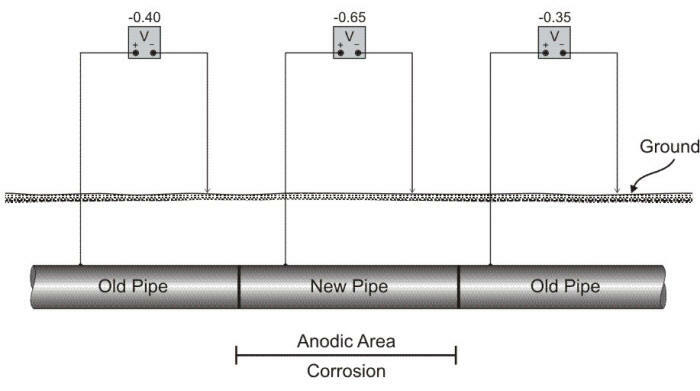 Schematic showing a differential corrosion cell created by replacement of a section of pipe. A common occurrence of surface film cell is found in older distribution piping systems where a section of pipe has been replaced because of corrosion damage. The new piece of pipe, exposed to the same corrosion conditions, logically would be expected to last as long as the original section. However, the new section will usually fail sooner than expected unless it is electrically insulated from the remainder of the system.